When I first encountered the Kogi, it was a quite extraordinary surprise. 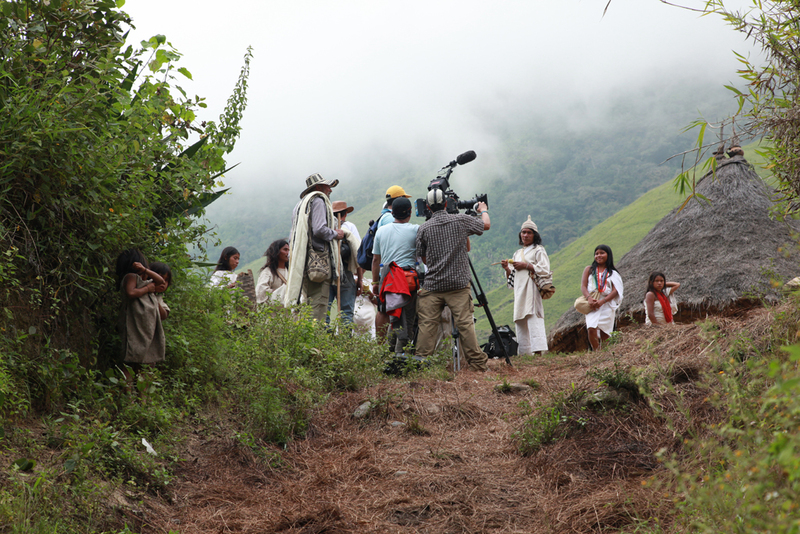 I was trying to research a film about the Lost City, the ruins of a large Tairona settlement on the steep slopes of the Sierra Nevada de Santa Marta. The Sierra is the steepest coastal mountain on earth, rising straight out of the Caribbean on the north coast of Colombia. Although the Lost City is only a few miles from the port of Santa Marta, it was buried in dense jungle, as was the whole of that side of the mountain. Knowing nothing of jungles or anthropology, I returned with great trepidation. 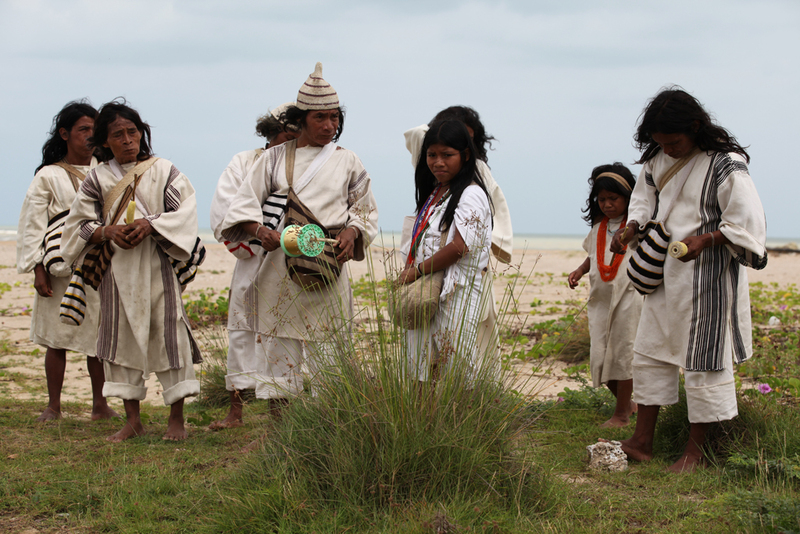 I was met in Santa Marta by two Spanish-speaking Indians in white cotton robes who were from related tribes. Tradition says that there are four tribes and four languages in the Sierra. The Kanguamo had been fully assimilated, the Arhouaco and Wiwa still had their languages but also had extensive contact with Colombians. The Kogi needed their help to deal with me. Adalberto, an Arhouaco, was a tall impressively stern man who immediately admonished me for sending three separate messages. This, I was told, was because I hoped that even if two refused one might accept – and that is how all other indigenous communities have been divided and destroyed. I must promise never to do that again. The other, Ramon, was from the Wiwa, but his mother was Kogi, he spoke the language and he had now been trained to act as their interpreter. We flew up by helicopter, to a settlement that I was told was Pueblo Viejo, the Old Town, above the jungle in steeply sloping savannah. The round thatched Kogi houses were almost deserted, but we were met by a young man, again in white robes, who took me to a breeze-block room, gave me water and strung my hammock. I had been warned to expect Indians to look prematurely aged and sickly, but he was fine and healthy. Soon others arrived, on foot or mule, all robed, all barefoot. And all, even the very elderly, looking very fit and sturdy. I was told to wait. I had the feeling of being nor just watched but seen; my character and motives were somehow transparently plain. A producer’s job is to woo people to work for his film, but here that was impossible. I felt that burden lift and vanish. Ramon translated, as I explained to the Kogi representatives that I had a machine that would enable people to see and hear them without coming to their mountain – “an ear that remembers and an eye that remembers”. I gave what I thought were reasons that they might want to use this and reasons why they might not, stressing the danger of attracting interest to themselves. I said that they would decide for reasons I would not understand (many grunts of agreement) and if they said “no” they would never see me again. I was asked two questions. Firstly, when people saw and heard them through the machine, would it really be them? What is the nature of this encounter? I said I could show them a camera, they could use it and decide for themselves. Secondly, how would they know that I would not use the machine to tell lies? I said there was no way they could know that except by deciding if I could be trusted. I was told they would analyse, consider, go to a peak at dawn and make a divination, and summon me again the next day. The next day I was summoned and asked if I had a machine that remembered what was said. Turn it on. Then an old man spoke: “In the beginning there was darkness, neither sun nor moon, only Aluna. Aluna was not a person, she was nothing at all. She was memory and possibility. And the Aluna began to think….” The story was taken up by three other old men – the Kogi equivalent of Genesis, the creation of the world and of humans, of them (the elder brothers) and of us (the younger brothers), and of our explusion from this Eden because we destroy nature, while they remained. And then came Columbus, our return to Eden began, and with it our destruction of the heart of the world. Now we were in the final days. But it could be stopped. BBC – tell the world! They were commissioning a film. I said that I did not even know what questions to ask, so I needed a year to prepare, and they also needed time to prepare for us. I would bring strange people, and strange machines. I was that they had begun work already and would only need half a year, but I would need a year. The BBC agreed to show it, and so we started work together. The film was their message; “From the Heart of the World: The Elder Brothers’ Warning”. And so Aluna was made. 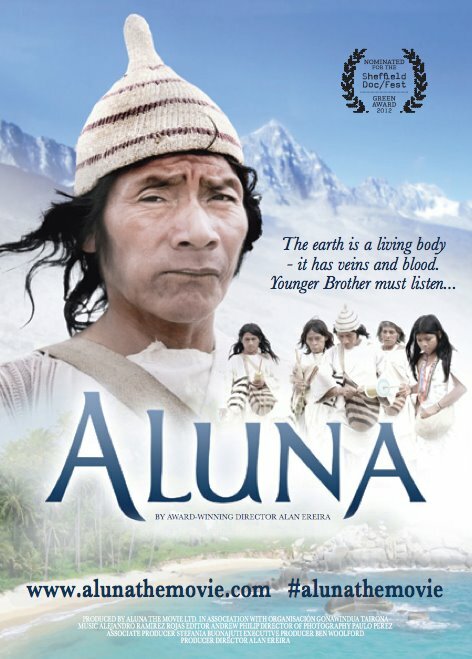 Alan Ereira opened the 2013 Orkney International Science Festival and provided special showings of the films From the Heart of the World: the Elder Brothers’ Warning and Aluna the Movie. Alan Ereira is an award-winning British author, historian and documentary filmmaker. After leaving university he went straight into the BBC, producing radio current affairs and history programmes for schools. In 1978 The Battle of the Somme was awarded the bi-annual international Japan Prize for the best educational radio programme. He then moved to television, and in 1989 Armada won the Royal Television Society award for best documentary series. In 1990 he made From The Heart of the World with the Kogi for BBC1. Alan left the BBC in 1996 and established Sunstone Films Ltd, making historical documentaries for television. He has written five history books and one about the Kogi. 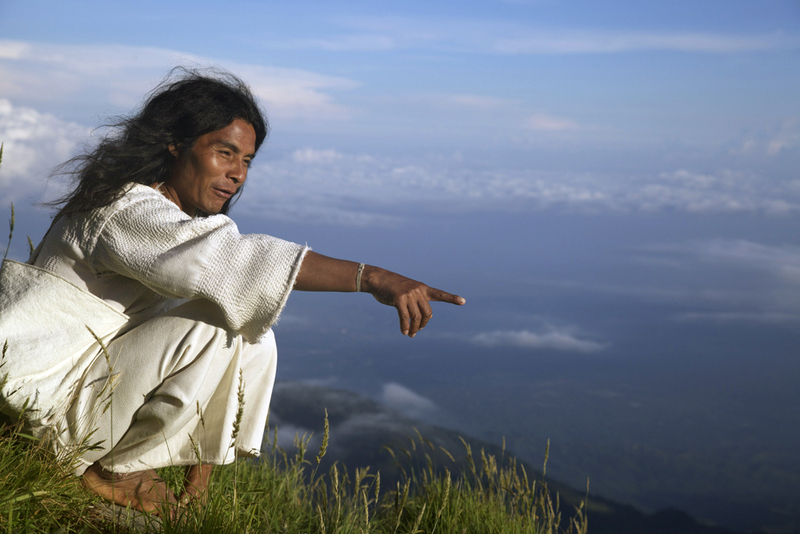 He is the director of the Tairona Heritage Trust, which has been established for their benefit. The Kogi own, directly and through the Trust, approximately 35% of Aluna The Movie Ltd.